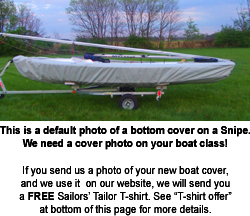 Bluejay Sailboat Bottom Cover -- One Design Sailboat Covers -- The Sailors Tailor, Inc. Protect the bottom surface and sides of your Bluejay sailboat from dirt, tar, and flying stones while trailing or storing. Sailors' Tailor is now using a new 100% Polyester Napbac material that is stronger, non-shrinking, and resistant to being destroyed by mildew, which was the main drawback to cotton napbac bottom covers. This Polyester Napbac has a gray acrylic coating on the outside and a 100% polyester soft napped, natural white, flannel like inside which polishes your racing surface keeping it slick. Bottom cover has a 5/16" elastic shock cord in the hem to hold the cover on to the deck (around perimeter) and webbing loops with tie cords across the deck. Designed with several screen covered drain holes and reinforcements where needed. High UV and mold resistance.